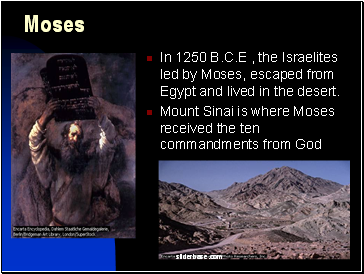 In 1250 B.C.E , the Israelites led by Moses, escaped from Egypt and lived in the desert. 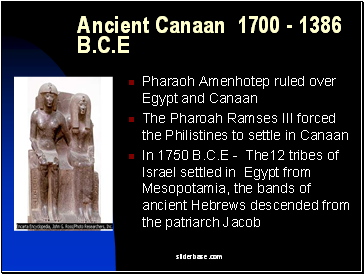 Joshua and the Israelites defeated the Philistines living in Canaan. 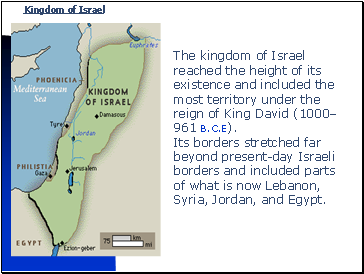 The kingdom of Israel reached the height of its existence and included the most territory under the reign of King David (1000–961 B.C.E). Its borders stretched far beyond present-day Israeli borders and included parts of what is now Lebanon, Syria, Jordan, and Egypt. 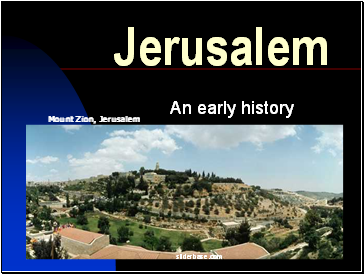 By 970 B.C.E, Jerusalem was a very powerful city. 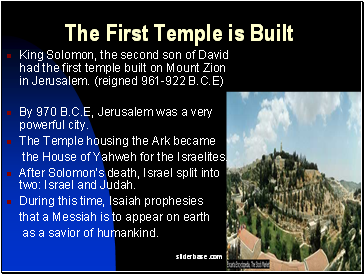 the House of Yahweh for the Israelites. After Solomon's death, Israel split into two: Israel and Judah. as a savior of humankind. 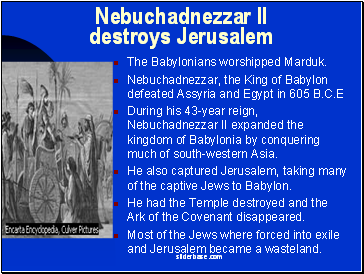 During his 43-year reign, Nebuchadnezzar II expanded the kingdom of Babylonia by conquering much of south-western Asia. 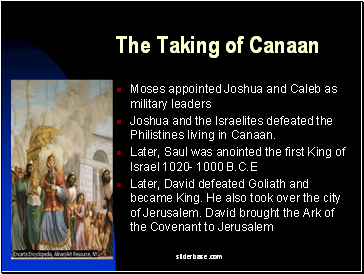 He also captured Jerusalem, taking many of the captive Jews to Babylon. He had the Temple destroyed and the Ark of the Covenant disappeared. 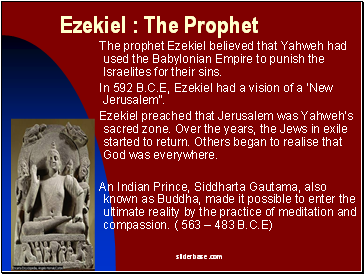 Most of the Jews where forced into exile and Jerusalem became a wasteland.